It was the last morning of a three-day outing with Nancy’s high school camping club. During our hike we spotted this squirrel carrying a pecan. 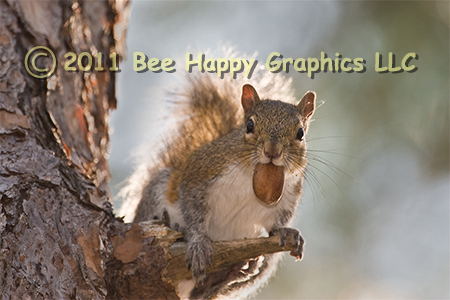 The image just struck us as funny; the squirrel looked like it was sticking its tongue out at us. The eastern gray squirrel is the most common mammal in the eastern half of the United States. Photographic details: Canon EOS 20D camera w/ EF 100-400mm f/4.5-5.6L IS USM lens set at 400mm. Flash was used. Camera was on f/6.3 for 1/250 sec at ISO 400. Fine Art Paper 11" x 14" 12" x 171/2"
Canvas N/A 16" x 221/2"